IT professionals don’t want to spend most of their time on repetitive, manual tasks – and businesses shouldn’t either. That’s why when one community bank was faced with a dauntingly large and manually intensive project, they zeroed in on an approach designed to lessen the burden on IT. 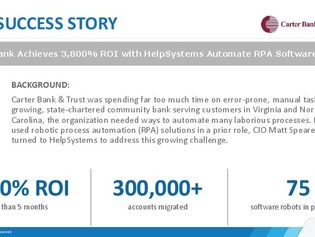 Click to get an executive overview of how this bank used process automation to help them migrate over 300,000 accounts, a process that had previously been slow and error-prone. Plus, you’ll find out how they achieved 3,800% ROI in less than five months.